Americas Cardroom continues to register significant player increases two months straight after opening its cashier for Bitcoin deposits. 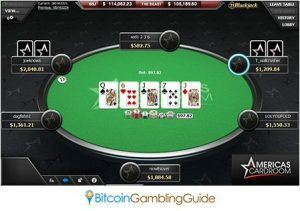 Leading the Winning Poker Network to the top of the list of the US-friendly unregulated poker sites, Americas Cardroom appears to be the latest eye-candy for online poker players who prefer to gamble bitcoins instead. Recent reports showed that Winning Poker Network witnessed a 73.8-percent jump in player traffic during January and February, with Americas Cardroom spearheading the campaign. The spike, however, is not entirely attributed to the website’s Bitcoin integration, but largely to the widely received Winning Millions event last month and the on-going 50 WSOP Main Event weekly qualifiers. Regardless, welcoming the digital currency at the beginning of the year marked a turning point in the network and the poker site’s career as they began to welcome more players. Americas Cardroom is yet to fully adopt Bitcoin payments, though. At present, only Bitcoin deposits are entertained on the poker site, leaving depositors with no other options but to use the conventional cashing out methods. This, however, will not be the setup forever since there are talks that developers are currently working on a system to allow players to withdraw in Bitcoin. While there is no formal announcement of the exact date Bitcoin will be added as a withdrawal option, digital currency fans can expect for this feature to be offered any time soon. Americas Cardroom is poised to rake in more beginning this month with the set of tournaments already lined up. Bitcoin poker players can join the Big 10 Guaranteed tournaments every day, as well as the daily Turbo 10 Guaranteed to get their hands on the pot. Another event to watch out for is the $100,000 Guaranteed tourney scheduled on March 8, where the prize at stake is twice the normal pot of the weekly GTD tournaments. Likewise, Bitcoin gambling enthusiasts will have more reasons to indulge in the online poker experience on Americas Cardroom when it unveils next month the Million Dollar Sunday event. The poker tournaments are expected to drive more players to the online poker room and bring more traffic to Winning Poker Network, especially with its latest giveaways and events, including the new World Series of Jackpots promo.